This book is set in a future where girls only live to age 20 and boys to age 25. This is a result of scientists creating the perfect human race free of all disease and illness, but they are now trying to correct the short life span. The cities are overrun with orphans and girls keep going missing. 16 year old Rhine Ellery is abducted by the Gatherers and sold into becoming a bride to Linden to replace his dying wife, along with two other young girls who become her sister brides. The book follows Rhine and her desperate attempts to escape that life and get back to her twin brother, with the help of a servant named Gabriel. I love Rhine’s character because unlike some other YA heroines she doesn't immediately fall desperately in love with the main male character and it makes it more realistic. I think her character is well developed and her relationship with her sister brides is built slowly and based on their experiences together rather than just blind friendship because the main character needs someone to communicate with. I like the way she is objective and doesn't hate Linden just because he is the one she is forced to be married to. She comes to her own conclusion about him and is really sympathetic towards him because she can see things from his perspective too. She understands everyone’s suffering around her, not just her own. Her relationship with Gabriel is built up over time and they don’t immediately jump into anything and his character is not an overshadowing hero to her heroine, which makes it more realistic. I think the world in the book is created in such a way that it seems so real and you believe that it could really happen. She could have gone down a completely different route with the idea of kidnapping young girls to marry them off to have children and I think she has made it into an amazing story of a strong young woman who has her own mind rather than focusing on that factor. I also liked the small flashbacks in it which explain her life before the abduction and life before the genetic engineering changed the world, which helps to understand why Rhine is the way she is and why she makes the decisions she does. I would definitely recommend this book to anyone who enjoys YA books, especially those who enjoy dystopian novels. I think it’s different to any book I've read and I thoroughly enjoyed it. The characters are well developed and I found myself really caring about what happened to the other characters not just Rhine. Also the world around them is described well and you have a complete picture of what is going on and why it all happened. Thanks Abby! :D What did you guys think? 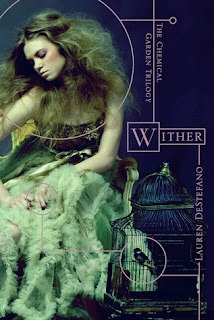 Have you read Wither? Let us know with a comment below.